ICL stands for Implantable Contact Lens. 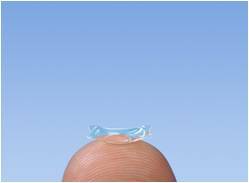 An ICL is similar to a contact lens, except it is placed inside the eye instead of worn outside. It is made of collamer material which consists of collagen and therefore is 100% compatible with the human body. In addition, the collamer also provides anti-reflectivity and UV protection. It is made to remain in the eye for a lifetime. What’s more, this medical device is invisible and the patient does not feel or see the lens once it is inside the eye. Lee Hung Ming Eye Centre uses the Visian ICL by STAAR Surgical. STAAR Surgical is an established medical device company. Originating from Switzerland, they are known worldwide for their ophthalmic devices. ICLs are able to treat a wide range of refractive errors. In other words, it is a suitable treatment for high degrees of myopia. As a result, many people who are unsuitable for LASIK in the past can now consider ICL. Most notably, implantation of these lenses do not require any structural alteration of the eye. As such, the results from the treatment are predictable and stable. ICLs have a proven track record – to date, more than 375,000 lenses have been implanted worldwide. The procedure received FDA approval for the treatment of myopia in the U.S. in December 2005. In addition, it received CE Mark in 1997, permitting sale in various European countries. Unlike LASIK, ICL is reversible. ICL implants can be removed even after surgery. How is an ICL procedure done? The ICL procedure is a 15-min day surgery. This reversible procedure is fast, precise and safe. Prior to implantation, some anaesthetic eyedrops will be applied to minimize discomfort. The doctor then creates a micro opening on the cornea to insert the lens. As the ICL is tiny and soft, it can be folded and inserted painlessly into the eye. Once in the eye, the lens unfolds into position. Furthermore, the incision does not need any sutures, it will seal naturally and heal in a short time. As a result, most patients experience an immediate improvement in vision quality. Generally, patients can return to daily activities the very next day. Who are good candidates for ICL? ICLs have been proven to be effective in patients within a wide range of refractive errors. Unlike other methods, the ICL procedure can treat up to -20D of myopia, +10D of hyperopia and -5D of astigmatism. Consequently, many people who were unsuitable for LASIK are good candidates for ICL. In addition, women who are pregnant or breast-feeding are not advised to undergo the treatment. The refractive status (degree) of the eye should also be stable for the past 1 year. However, this treatment may not be suitable for everyone. Undoubtedly, there are inherent risks present in every surgery. For example, some risks include the need for a second surgery, temporary swelling or inflammation, cataracts, increases in eye pressure, retinal detachment, endothelial cell loss and reduced visual acuity. Nonetheless, Implantable Contact Lenses are an excellent treatment option to consider. As such, it is important to find an experienced surgeon. Owing to their experience, skilled surgeons are able to minimize surgical risks for better treatment results.